For those of you who live in suburbia — which, for a New Yorker, is anywhere outside of the five boroughs (Brooklyn, Manhattan, Bronx, Queens, and Staten Island) feast your eyes on a tiny NYC kitchen! Also, see the distance between me and my neighbor?! It’s a good thing we get along! Your kitchen looks very cozy, Christina. But it’s bigger than the one in my nephew’s apartment. The one I met, Persis? He lives in a studio in Manhattan, right? I guess that means I’m living large in Brooklyn! LOL! You could lend an egg to your neighbor by throwing it! I love it! Cozy kitchens make for the best food. There’s never any room to get around each other, so you just hug all the time! So much love in the kitchen! Where’s your braid of garlic? I was thinking the same thing E…that if you needed something you could just toss it across the empty space. The garlic is on the the other side of the rack! Promise! LOL! Love it…and the cutting board in your earlier post. Well, dear Christina, at least there’s not a lot of wasted space, right? And truthfully, not here out in the boonies where we are, but there are neighborhoods down here in Florida that even the houses in some of the gated communities are that close. It’s amazing how different our lives are even within the U.S. I live in the country 1.5 miles from our town of 1100 people. Yes! It is amazing how our way of life in this great country varies so greatly according to simple geography! My Kitchen is about the same size as yours. I make do pretty well Christina but in the dreams there is a huge Island and a pot rack….oh well! Like you I make do with what I have. In fact I had a really huge kitchen in the last house I lived in but I like this one even better. 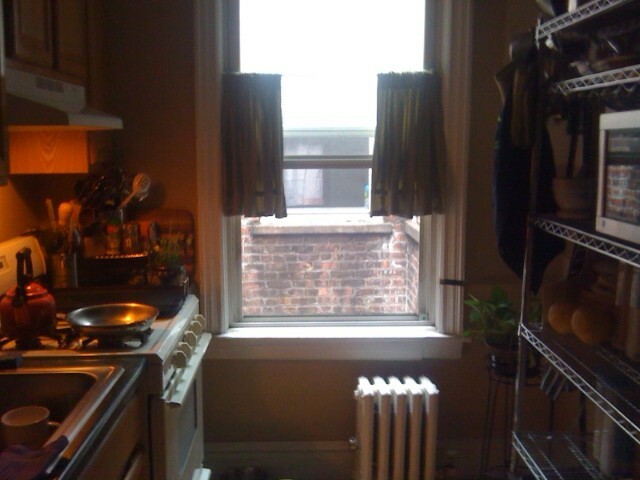 Counter space is nice though…You and your neighbor could have a tea party right through the window. I varies here in West Virginia, we have tons of acreage with lovely homes but here where I live in Suburbia the houses are on top of each other. I think your little kitchen is lovely and beautiful dishes are made there with love, so what’s not to like about it? I think it’s wonderful. Awww…thank you Teresa! Yes, we make do with what we have! And, it really is not so bad, is it? If anything, it helps overcome any slothfulness in that ALL the dishes are done by hand. Like Dana, I do not have a dishwasher so it forces me to clean as I go! At any rate, bless God for little kitchen’s, right? Yes Diana it’s beautiful isn’t it? I feel your pain!! I have no counter space just a tiny square on each side of the sink, one Christmas I mashed potatoes on top of the dryer because there were no plug-ins in the kitchen to plug in the mixer. I have never owned a dishwasher either, there is no space for it in my kitchen. You have to get real inventive in these little kitchens. I will have to post some pics on facebook. I love my little 960 square foot house but the kitchen is beginning to grate on my nerves after 16 years of cooking in it. The houses in my neighborhood are really close together too. @ Diana – I’m so glad you think it’s neat and tidy! Of course, I won’t be posting any pictures of any other rooms! LOL! It is a very nice kitchen! And loads of fun sitting on the stool watching Steve cook! Maybe one of these days I can return the favor…you sit at my kitchen table watching me cook! …after a nice hike in the mountains. Love it! Reminds me of Europe and comfort. Love you!! It’s funny how everyone thinks it looks “cozy”! It must be the yellow bug light that generates the warm yellow glow that I put on the range hood (or whatever that overhead thingy is called)! LOL! It’s nice,Christina, to be able to picture you in part of your home. 🙂 Love you!! Hope you had a beautiful Lord’s Day! I dream of visiting you in your kitchen someday and feasting on a piece of that Red Velvet Cake of yours~! That would truly be a dream come true for me! If you ever came to visit Brooklyn, I would make linguine with shrimp & even “overcook” the pasta for Robert! LOL! I picture you making the coconut cake! And the dogs sitting in the floor doing that drooling/begging things doggies do in Kitchens. I love the food and the stories everyone is sharing, but I have to say Dana mashing potatoes on the dryer is a classic. Love you Christina, you have such wonderful blog posts! You know…it doesn’t matter what size your kitchen is…what matters is your cooking! I bet you are a great cook too! God’s light shines in large and small homes…that is the important thing! Love the picture Christina!